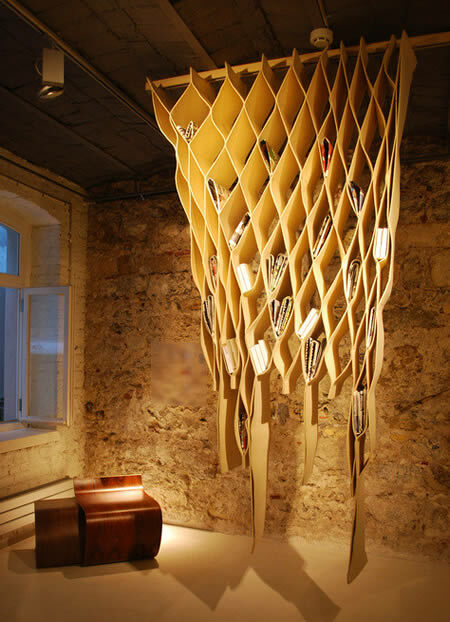 From Frankfurt-based studio Ilio comes Bookwave, a curtain, room divider and bookshelf all rolled into one. The soft soul of the fabric provides all these functions in a new approach as it expands to any size. 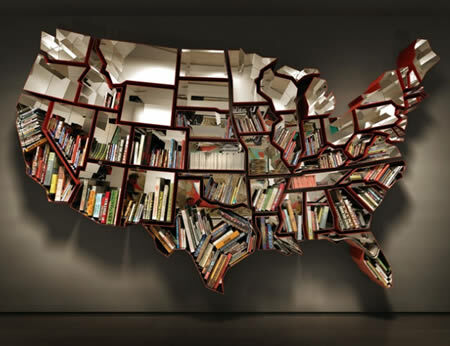 This really cool bookshelf, with each shelf being the outline of a US state, is actually a work of art with the incredibly long and slightly confusing title of “Oh, the farmer and the cowman should be friends” (the title is is actually a song from the old musical Oklahoma, thanks Teija). It was created by artist Ron Arad and is made of corten and mirror-polished stainless steel, measuring over 15 feet wide. It would be pretty cool if each shelf had books related to or about that particular state. 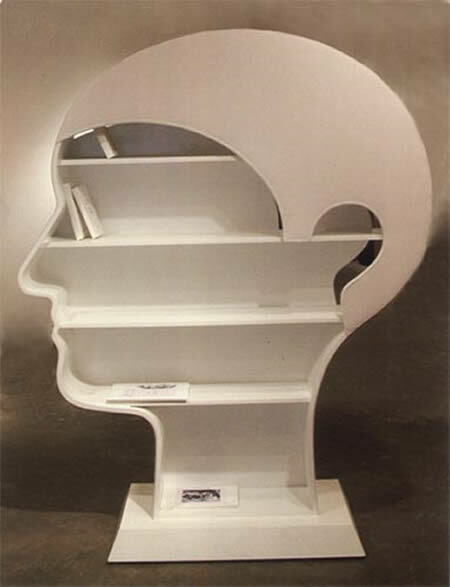 The Library Head is a unique bookshelf that was designed by Nicola L. in the shape of a head. I can't think of a better place to store all of your favorite stories. Ever wanted a polar bear bookshelf in your living room or home library? It's definitely safer than having the real thing and in the case of the Joe Bookshelf by iBride is undoubtedly easier to manage as well. The collector's bear bookshelf is made from a high-pressure laminate with a pre-recycled wood core. 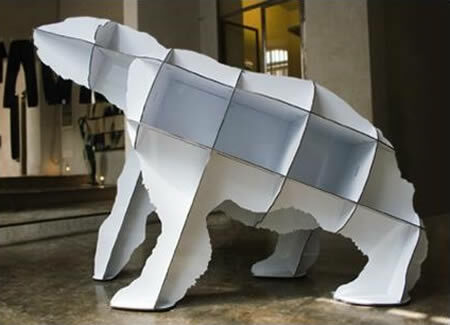 In itself, the bookshelf is made up of lattice-work shelves which have been created in the shape of a polar bear. The structure is both sturdy and functional which allows for a wide range of uses. 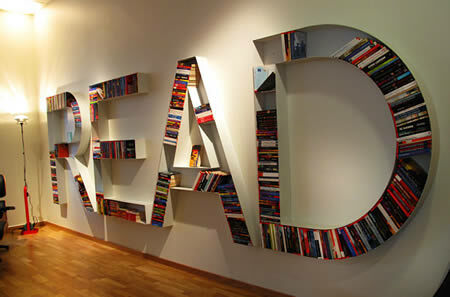 The polar bear bookshelf's creators are iBride, a French family business based in the south of France. Bookshelves don't have to come in the usual boring shape. 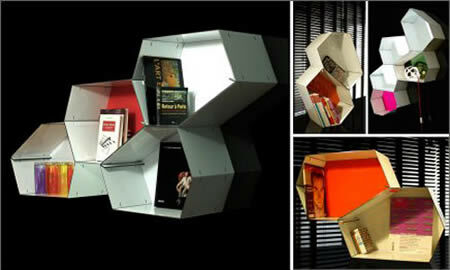 They can be like a tree with branches such as what this Wisdomtree bookshelf presents. 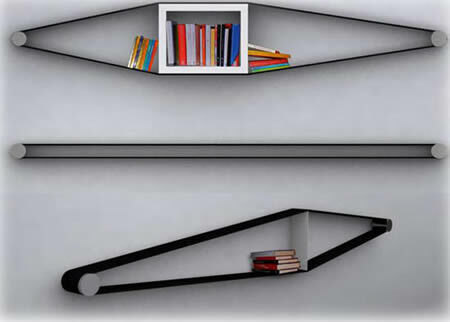 This little weird bookshelf was designed by the Spanish designer Jordi Mila. And got its design inspired by a glowing tree. But somehow it looks a little weird and it doesn't look like a normal tree will branch out in this way. 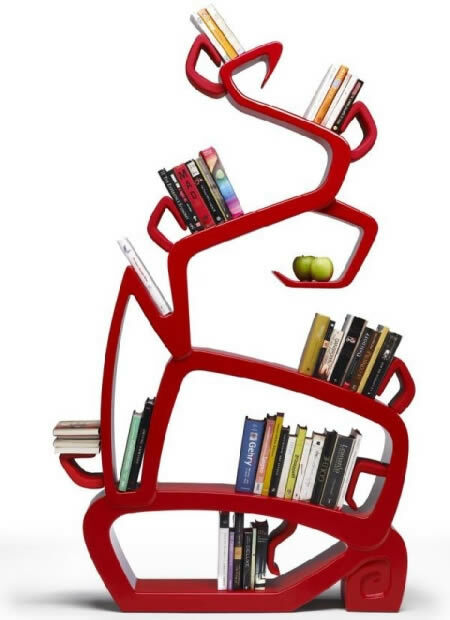 Your books seem to be scattered on the branches on this tree-shaped bookshelf, which shall serve pretty nice as an eye candy in your living space. Philippe Macaigne, a designer from France, invented Rock, which is an interesting modular storage system that can be used on the ground or mounted on the wall. It is available in a pack of 5 modules numbered from 1 to 48 and available in two colors. Each pack has 3 modules monochrome and 2 modules with a colored background. It is made by the company Craftbymac, the material is alucobest, all with the price of 120€. 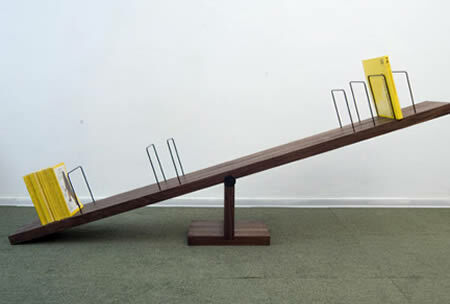 The See-Saw Bookshelf is exactly what it sounds like: a giant see-saw for you to put your books on. Although I'm not sure what kind of person could actually put this in their home. I guess it's targeted at all the people out there who happen to live in a playground. 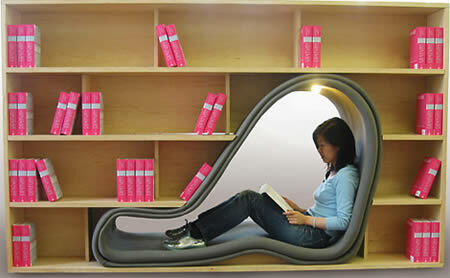 The Cave, from designer Sakura Adachi combines a bookshelf and a comfortable place to sit and read. Aimed at taking you back to your childhood when you used to make forts with stools and blankets, the thing is supposed to be a calming place to relax and unwind. The unit has bookshelves on both sides, with the cave crawlspace in between. So it's made to be a room divider and not pushed against a wall. Do you want a better hint than that? Usually changing the shape of a bookshelf means getting out the hammer and plywood. Not so the Elastic Bookshelf — this simple idea loops a stretchable belt around two pegs, providing plenty of possible configurations. Pop in a piece of wood to open it up, or just leave it wrapped between the two pegs to keep things straight and narrow. A design project from Arianna Vivenzio, the Elastic Bookshelf isn't in stores just yet. This table-shelf by Minottiitalia looks great, too! 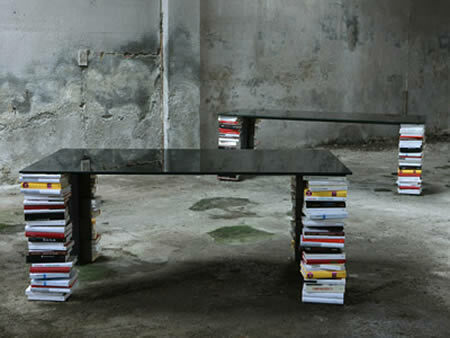 The table's legs have little shelves so you can really stack the books under there. Point Architects from Tokyo combined a bed with a bookcase and the result was called the Uroko House. 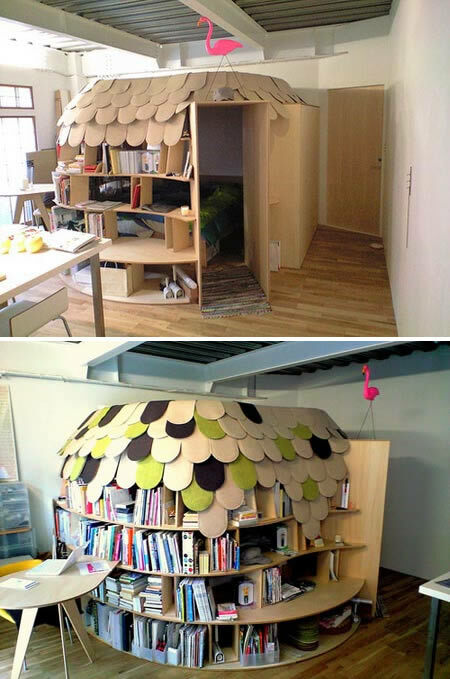 The incredible bookcase completely surrounds this bed, making it look like an igloo made of books. They also prepared a step by step project of how the Uroko House was created. The final result looks good, but unfortunately is not too practical, and takes a lot of space. Anyway, I'm sure little kids will still love this project.